Home » Health & Fitness Articles » 7 Dangers of a Sedentary Lifestyle: Is Sitting Too Much Killing You? It is well scientifically that an overly sedentary lifestyle is bad for you, and most people know that they need some form of exercise or activity in their day to day lives. 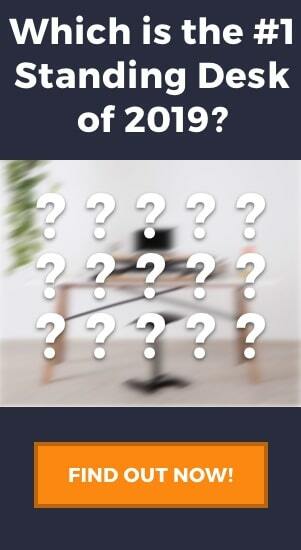 But, do you know exactly what the major dangers of sitting too long are? Of course, everybody knows that you don’t burn calories and you will gain more weight, but did you know that you could be causing long-term damage to your overall health too? 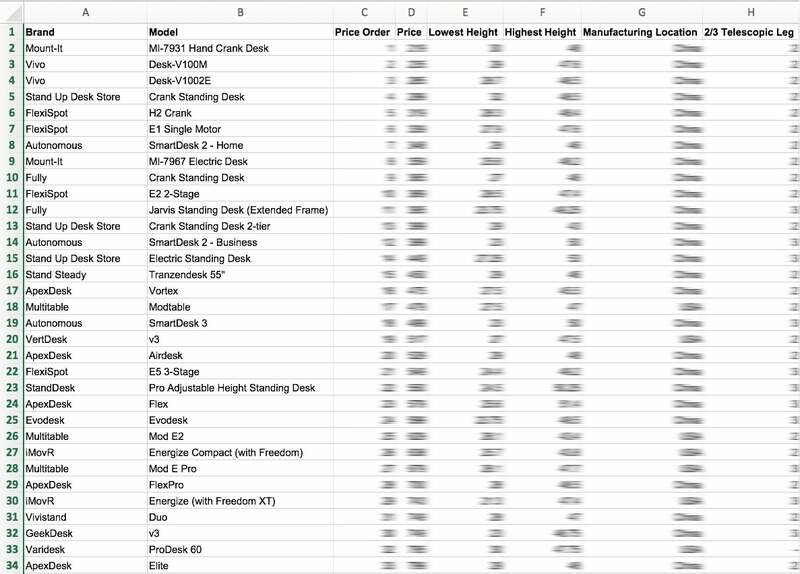 We’ll start with the most obvious problem, stiffness. This is already a well-known fact, but it shouldn’t be overlooked. Stiff shoulders and neck are quite a discomfort by themselves but if experienced for longer periods of time they can cause further muscle problems. You probably guessed it on your own, but moving around is actually very important for various metabolic processes. This means that sitting all day makes it much harder for our bodies to digest carbohydrates and fatty acids which we take in through our diet. As time passes, the overall efficiency of our digestive system becomes decreased, so the retention rate of those sugars and fats becomes higher, causing us to gain more weight. Not only that but standing burns more calories than sitting, so by the simple fact that if you consume more calories than you burn then you gain weight, sitting is more likely to cause you to put on a few pounds. Atrophy is what happens to muscles when they are unused for long periods of time. This often affects people who are bed-ridden and people who are in comas for long periods. The muscles deteriorate and shrink becoming weak and this can lead to imbalances and general physical health issues in the long run. Take time to at least do some basic stretches or a few squats, as your legs will be more than grateful for it. Since glutes, quads and other leg muscles are crucial for stabilizing the rest of your body, it makes sense that you should pay attention to them and try maintain and build strong muscles. 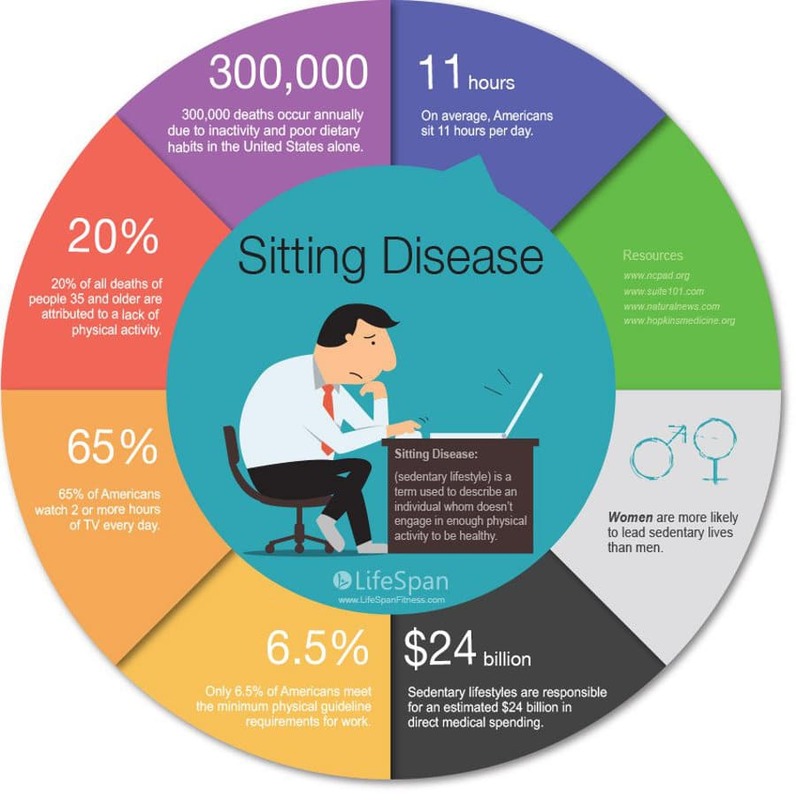 This infographic by LifeSpan Fitness is a fantastic visual representation of the dangers of excessive sitting. Just like leg muscles, hips are crucial for supporting and balancing the upper body. Sitting too much can actually shorten hip flexor muscles, which in turn leads to problems with hip joints. Tight hips also cause problems with your posture and you may develop something called anterior pelvic tilt. These issues don’t stop there either. Hip tightness can cause you to place much more stress on your lower back and this will cause compression, stiffness, and other issues. Some research claims that sitting for extended periods of time can raise the body’s blood glucose level. This fact can contribute to early onset of Type 2 diabetes. Unfortunately, it is not something exercise will really fix, and you really need to stand to alleviate this issue. There are also ways to sit properly which can help. The same as diabetes, increased risk of heart disease is of no surprise when we talk about the harms of sitting. Lack of physical activity leads to a poor heart condition, and your muscles will overall burn less fat. This can lead to your body storing fatty acids that can clog your heart and lead to serious health issues. Most people probably don’t think of it, but it`s actually logical that our blood would accumulate in our legs excessively when we sit for long periods of time. This can cause varicose veins which are usually not very dangerous, but, in some cases, varicose veins can give way to blood clots which can cause numerous serious health problems. Deep vein thrombosis, or DVT for short, can occur due to sitting too much, even if it is just a few hours. This is most obvious during longer plane flights. DVT refers to a blood clot which is formed in your leg veins, and which can break off and could block blood vessels in your lungs. There are many ways to get more active and live a less sedentary lifestyle. 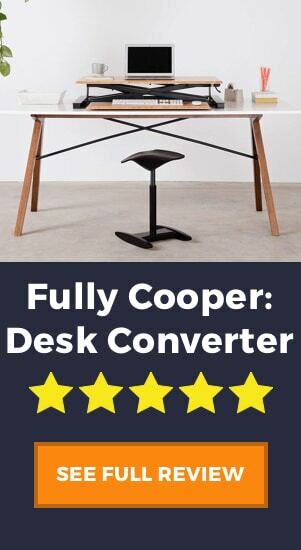 Firstly, we think it is work taking a look at a height adjustable desk to see if this would be a viable solution for you. These desks allow you to switch between sitting and standing throughout the day which will alleviate a lot of the aforementioned issues. Finally, if you already own a standing desk and you want more, many people these days are choosing to create a treadmill workstation. Using an under desk treadmill base and a standing desk you can create a workstation where you can walk while working. We believe any of these will be beneficial in the short-term and long-term for your health. Karimé González.Physical Inactivity, Sedentary Behavior and Chronic Diseases. Korean J Fam Med. 2017 May; 38(3): 111–115. Sperlich B. et al. Objectively measured sedentary time, physical activity, and metabolic risk: the Australian Diabetes, Obesity and Lifestyle Study (AusDiab). Diabetes Care. 2008 Feb;31(2):369-71. Epub 2007 Nov 13. Siddarth P. Sedentary behavior associated with reduced medial temporal lobe thickness in middle-aged and older adults. PLoS One. 2018 Apr 12;13(4):e0195549.